Based in Newcastle, Australia, BusinessCraft Pty Ltd provides accounting and mission-critical software systems to the manufacturing, service, and building industries. Recently one of BusinessCraft’s customers requested functionality that would enable the customer to use Crystal Reports to generate PDF sales reports for management. BusinessCraft was able to meet this customer’s objectives by using Synergy .NET to develop a dashboard application that plugs into BusinessCraft’s existing Synergy/DE-based application. 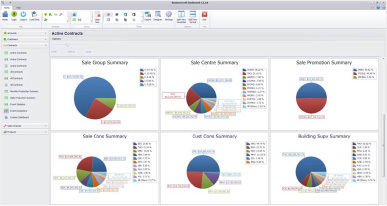 Another option BusinessCraft considered was Microsoft Excel, using macros to do the procedural analysis. “This option would have definitely been the easiest and fastest way to achieve our customer’s goal,” states Parish. “However, it wasn’t practical in the long run. Two years down the road, if the person who wrote the program left the company, no one would know how to support it.” Furthermore, this solution would be harder to maintain, as each customer could have different versions of Microsoft Excel installed, representing a logistical nightmare. BusinessCraft ultimately went another direction, choosing to use Synergy .NET to create a standalone dashboard application that could integrate with their existing traditional Synergy application. “We already had a goal to create a dashboard application, so going down this route was a way to add momentum to that project,” explains Parish. The Dashboard application is based around a core framework for displaying views with the available “plugin” modules, using the Synergy License Management SDK to control which modules customers can access. The Synergy Code Generator was used to generate the Data Access classes using the schema information already set up in the repository. States Parish, “We have found the Synergy Code Generator to be a great time saver for coding these classes which can be very laborious if done by hand.” The Data Access classes use the new Select class to retrieve a collection of records based on filter criteria. All data access is automatically cached for each table to make repeated searches more efficient. So far, feedback about the Dashboard has been extremely positive. 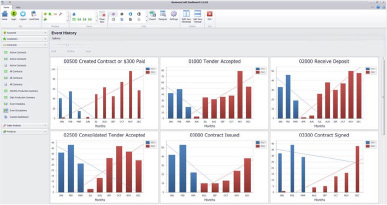 Another of BusinessCraft’s customers, a local building company called ConvaTech, predicts the Dashboard will save them approximately two days a month in preparing management financial reports. Plus, they have access to their information daily instead of having to wait until the end of the month. Another main benefit of the Dashboard is that even ConvaTech’s employees who don’t use BusinessCraft’s software are able to use the Dashboard and get access to all of this reporting as well. The next steps for the BusinessCraft Dashboard are to extend the analysis to include other modules in the BusinessCraft suite, such as General Ledger, Suppliers, Inventory, and Contracts Management, and to roll these out as each module is completed.